I bought these as a gift for my granddaughter to use on a college trip overseas. They are perfect for travel, small but powerful and waterproof so you don't have to worry about using in the rain. Bushnell products are top quality. I currently have a pair of 10x25 Celestron that is very good but I needed just a little more magnification that this pair gives. 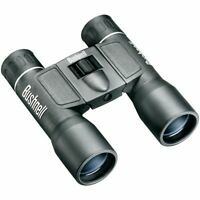 It is really well made, I'm sure I'll have years of enjoying this set of binoculars. Plus it's waterproof, never have to worry about it getting destroyed in the field.